Let’s face it, chickpeas couldn’t fight their way out of a wet paper bag! They’re not known for their competitive ability and generally, any weeds surviving in a chickpea crop are destined to set truckloads of seed. Sowthistle, like all weeds, likes to take advantage of poor competition. It has evolved resistance to a number of herbicides, including glyphosate, and is a rather social beast spreading its seeds far and wide. There are few herbicide options for sowthistle control in chickpea crops, making the perfect recipe for a good ol’ sowthistle blowout. Despite all of this, the latest research by Michael Widderick, Adam McKiernan and Greg Harvey from QDAF with GRDC investment is finding that chickpeas can win the competition against sowthistle if they stack their deck. Growing a chickpea crop at narrow row spacing and high crop density in northern cropping regions can greatly reduce sowthistle seed production without reducing chickpea yield. Once again, narrow row spacing and high crop density produce perfect research data showing that crop competition is a big deal. Kerry McKenzie of QDAF, Queensland (left) and Mike Balzer, private consultant (right). 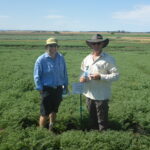 In the north-eastern cropping region of Australia, farmers are faced with a difficult weed management scenario in their chickpea crops. Chickpeas are known to be poor competitors and there are limited herbicide options for the control of common sowthistle (Sonchus oleraceus). Further to this, there’s now also an increased number of sowthistle populations with confirmed glyphosate resistance. Whilst glyphosate won’t be an option in crop, sowthistle is an all-year-round weed, so effective control in crop will dictate what population you’re faced with in your subsequent fallow. 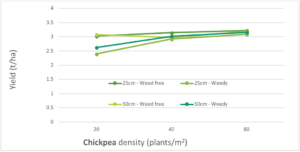 Research conducted near Warwick, Queensland has compared chickpea grown at row spacings of 25 vs 50cm at crop densities of 20, 40 and 80 plants/m2. Sowthistle seed was sown in each plot at a density of 70 seeds/m2 creating a consistent sowthistle density across the trial and ranging from 12 to 30 plants/m2. Sowthistle seed production was the main measure of success. The chickpea (cultivar PBA Hatrick) was planted June 8th, 2017 using a Kinze disc planter with fertiliser Granulock Z at 40kg/ha applied at planting. The field trial was irrigated and fungicide and insecticide applied as needed. No herbicide was applied in the trial to assess the full extent of crop competition on weed control, but non-target weeds were manually removed. The graph below shows exactly what we have previously seen for other weeds and other crops. Weeds hate crop competition such as narrow row spacing with high plant density. Overwhelmingly, sowthistle seed production was reduced at a narrow chickpea row spacing and high crop density (see Figure 1). 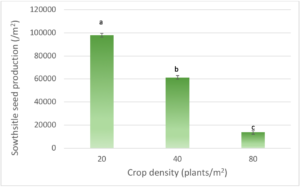 Figure 1 – Effect of chickpea row spacing (cm) and density (plants/m2) on sowthistle seed production (/m2). Lines show the trend in data. Changing the chickpea row spacing from 50 to 25cm more than halved sowthistle seed set (see Figure 2). Figure 2. Impact of row spacing on sowthistle seed production. Significantly higher seed production at 50cm row spacing. Bars with a different letter are significantly different at P=5%. LSD as shown in graph = 3900. Crop competition data is beautiful, isn’t it! High chickpea density smashed the sowthistle seed set (see Figure 3). Figure 3. Impact of crop density on sowthistle seed production. Significantly higher seed production at 20 plants/m2. Bars with a different letter are significantly different at P=5%. LSD as shown in graph = 3272. 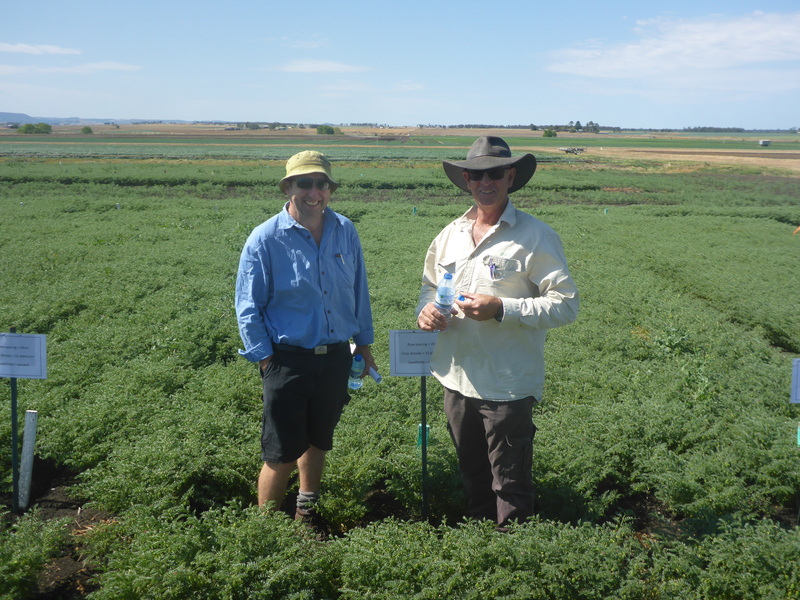 In this trial, in a weed-free situation, chickpea yield was not affected by row spacing or seeding rate. 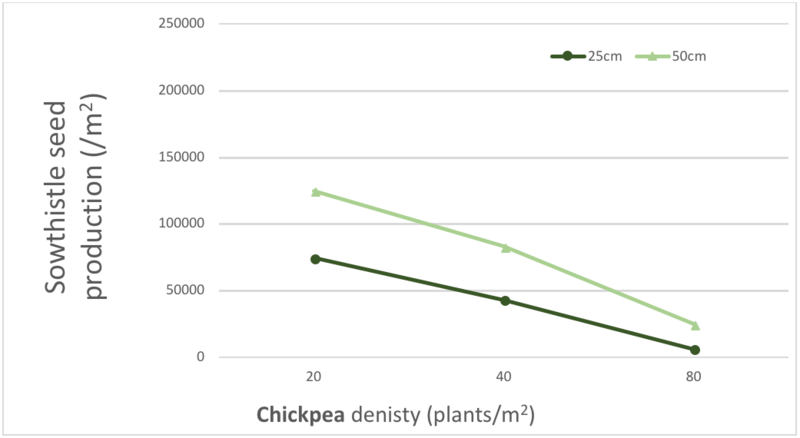 However, other research has demonstrated increased chickpea yields at high crop density and narrow row spacing (see Figure 4). 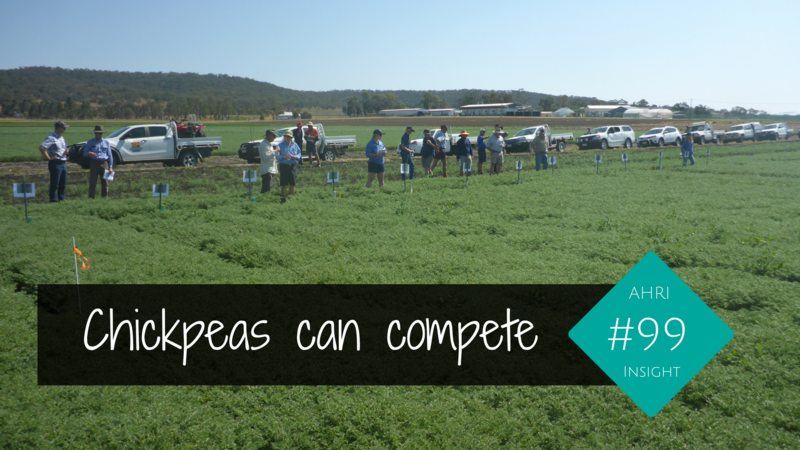 Research conducted by QDAF and led by Kerry McKenzie has shown consistently that narrow row spacing in many crops including chickpeas has either maintained or increased yield. When sowthistle was present, there was an overall trend for an increased yield at higher crop density. Figure 4. 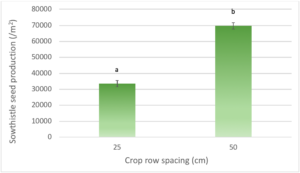 Effect of chickpea row spacing (cm), crop density (plants/m2) and the presence or absence of sowthistle, on crop yield (t/ha). The graph shows the trend in data. Who would have thought that the humble chickpea would have the gumption to compete with weeds? It just goes to show that all crops have the ability to compete if the crop architecture is right. Further research from this group is evaluating the competitiveness of other crops including faba bean, sorghum and mung bean against the troublesome weeds sowthistle, barnyard grass and Feathertop Rhodes grass. We’ll have to wait for the results, but you would borrow money to bet on the fact that narrow row spacing and high crop density will win the battle with weeds yet again.